One of the big successes of this season has been the use of foundationless frames. These have reduced my use of foundation by over 75%, leading to a significant accumulation of unused packets which were ordered before the season started (as an aside, if stored flat in a cool place foundation should be OK for years, simply needing a quick blast with a hairdryer to remove the pale bloom that appears). Aside from the economic benefits, I’m convinced that the bees draw comb on foundationless frames at least as fast as they do on frames with foundation. In some cases, given the choice, the queen also starts laying in the foundationless comb earlier. 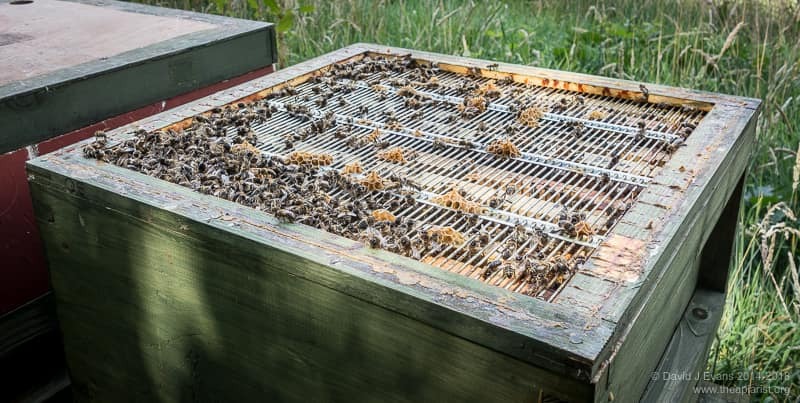 Finally, they are an ideal way to prepare a bait hive, providing the volume the scout bees are seeking coupled with the ‘order’ that will ensure that any swarm will build comb where you want it. Preparing new foundationless frames takes a litte more effort – you need to drill the sidebars and ‘wire’ them with nylon monofilament fishing line before adding a narrow starter strip. At least, that’s what I do. In my view this effort is more than offset by the benefits they provide. 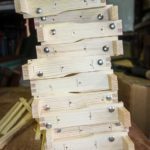 Framebuilding is made almost pleasurable by using a nail gun … look out for special offers on these from Amazon where a suitable model (Tacwise EL191) was recently reduced to under £40. Foundationless frames also work well in supers. I prepared a few boxes of these this season and extracted them using a radial extractor. With a couple of exceptions the frames all survived. The only two that collapsed were either partially drawn or incompletely filled. I treated the foundationless frames as roughly (or carefully) as those with foundation during extraction – I uncap with a hot air gun and wind them up to full speed as quickly as practical. The only real problem I had with foundationless frames in supers was getting unwanted brace comb in boxes where the frames were not vertically aligned with the box below. 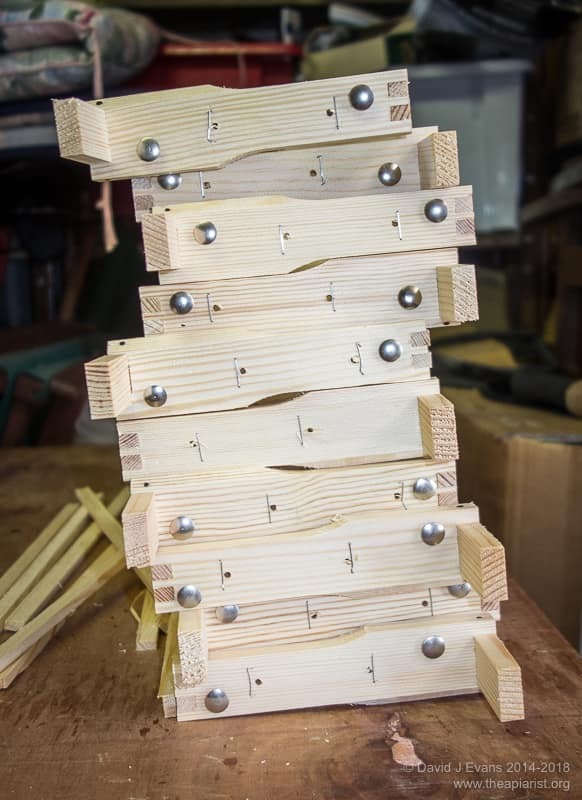 For example, an eleven frame brood box topped with an undrawn 9 or 10 frame foundationless super sometimes resulted in the bees trying to build brace comb between the frames. This problem was partially, though not completely, solved by mixing foundationless frames with a few frames containing full sheets of foundation. Next year I will get the comb drawn in a super filled with foundationless frames, and then remove a couple and space them further apart. Other than the infrequent building of brace comb, which can usually be avoided by careful frame spacing, I’ve only had two issues with foundationless frames that might be considered problems. The first is the bees chewing through the monofilament supporting ‘wires’. I’ve been using 15 kg breaking strain cheapo mono picked up from eBay. 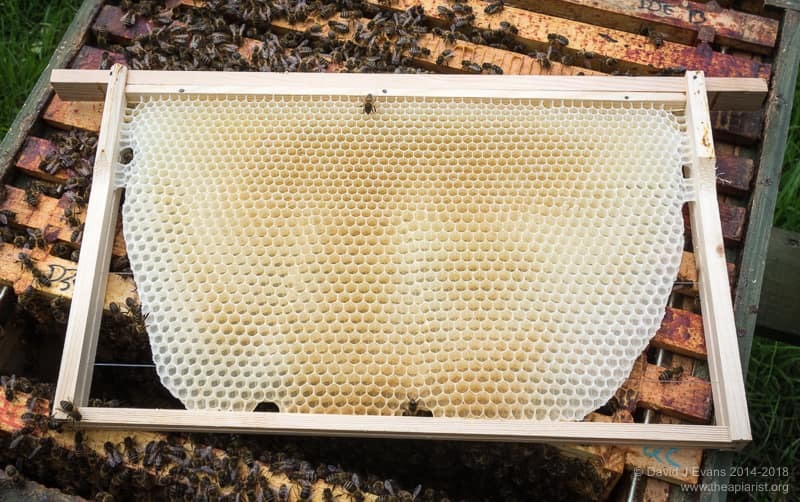 If the frame isn’t drawn evenly (perhaps because the hive isn’t perfectly level) the exposed mono on one side of a frame is targeted by workers and sometimes nibbled through. In a frame with three transverse strands (i.e. a deep, or brood frame) this is usually the one closest to the bottom bar. This isn’t a major issue – it leaves a trailing strand which needs to be snipped off but the majority of the frame is usually drawn sufficiently well that it’s robust enough for the usual stresses and strains of inspections. In over 100 foundationless brood frames used this year, none have been unusable after the mono has been chewed through (which only happened on half a dozen). I’ve bought a big spool of 30 kg monofilament to use next year. At about 1p per metre it’s good value but may be a little less easy to work with. The second ‘problem’ is minor and depends upon your chosen method of swarm control. Colonies often draw out significantly more drone comb in foundationless frames than they do on standard foundation. It’s not unusual to have big slabs of drone comb on one or more of the outer frames of the brood nest. As a consequence, these colonies have lots more drones present throughout the season. Interestingly, I’ve not had increased problems with Varroa and deformed wing virus in these colonies. 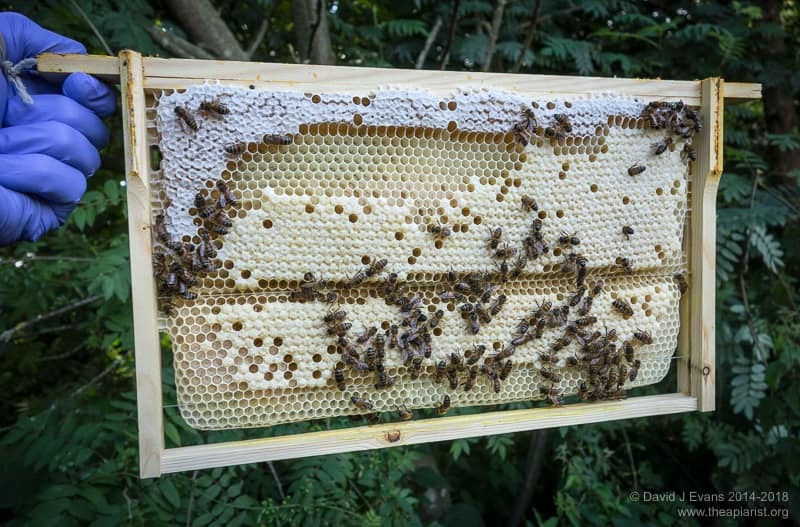 I generally use the Demaree method of swarm control, shifting the original brood box containing all the sealed brood above the queen excluder for a three week period. Consequently, drones emerging in the upper box cannot get out of the hive. If they are not periodically released – for example, during inspections, or by lifting the roof and crown board every few days – they sacrifice themselves struggling to get through the excluder. The standard inspection interval can uncover hundreds of dead and dying drones wedged half way throught the excluder. This is unpleasant, both for the beekeeper and the drones. Next year I’ll experiment with adding an upper entrance to allow the drones to escape – either by proving a thin shim of softwood underneath three sides of the upper box, or by providing a temporary hole through the side of the box (closed with a cork when not needed). Finally, using a steam wax extractor on foundationless frames destroys much of the tension in the monofilament. They might still be usable – I’ve not tried – but it’s an easy job to replace it. 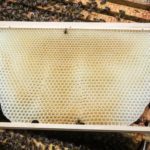 This entry was posted in Beekeeping, Frames and tagged bait hive, drones, foundationless, frames, supers on September 27, 2014 by David. I know a foundationless beekeeper who has the theory that more drones distracts the varroa from going into worker cells, and so keeps the workers healthy. Seems plausible.